EDIT: As of 2019, there is a new RTSS Scan Line Sync mode that is superior to this Low Lag VSYNC ON HOWTO. Check out this HOWTO on Blur Busters Forums as an alternative. Often, competitive gaming and eSports often use VSYNC OFF to reduce input latency. Even frame rates above refresh rates can reduce lag further, especially or CS:GO and Quake matches. However, VSYNC ON is much more enjoyable for certain games/emulators/some console ports which behave much better and more smoothly with VSYNC ON. Also, Motion Blur Reduction such as ULMB can amplify visibility of stutter/jitter. By using VSYNC ON, you can easily reduce or solve these problems. Unfortunately, VSYNC ON can often add input lag! What do we do? The great news is there are ways to reduce VSYNC ON input lag! Several tests were done by Jorim Tapley, RealNC and others in the Blur Busters Forums, testing multiple methods of frame-rate capping to find the lowest-lag, stutterless method of reducing VSYNC ON input lag. This tip applies if you don’t have a variable refresh rate (VRR) monitor such as G-SYNC or FreeSync. We found that only one frame-rate capping software, called RTSS (RivaTuner Statistics Server) was able to reduce VSYNC ON lag without adding visible stutters. Other frame rate limiter software (in-game, NVInspector, etc) were not as accurate. Go to TestUFO Refresh Rate and measure your exact refresh rate to at least 3 decimal digits. Subtract 0.01 from this number. Use that as your RTSS frame rate cap for that specific game. IMPORTANT: Replace “59935” with TestUFO Refresh Rate, subtract 0.01, and remove the decimal point. Use “VSYNC ON” or “NVIDIA Fast Sync” or “AMD Enhanced Sync” for that specific game. Fast Sync and Enhanced Sync may sometimes stutter less than VSYNC ON with frame rate caps. Technical explanation: This avoids frame buffers from piling up to create input lag. In addition, stutters are avoided, thanks to RTSS microsecond-accurate frame rate capping precision. High speed video tests confirmed a reduced lag of approximately 1 to 2 less refresh cycles less input lag relative to VSYNC ON. Also, RealNC from Blur Busters Forums has a longer HOWTO on Guru3D Forums on this technique, including additional tips on how to edit your RTSS configuration file, and setting pre-rendered frames to 1 in NVInspector. Follow this section only if you’re getting stutter problems with the low-lag VSYNC ON trick. Sometimes, different numbers may work better for Step 3 above. The RTSS recommended 0.01 number difference (between Hz and fps) is simply a starting point. Experiences will vary per system and per game engine. Verify your game is running at the correct refresh rate. Sometimes games will run at a refresh rate different than the Windows desktop. NVIDIA “Fast Sync” or AMD “Enhanced Sync” can be experimented with, instead of “VSYNC ON”, to allow tighter frame rate capping for the purposes of avoiding stutters. They already help lag, but they may stutter badly in certain games unless the frame-rate is capped. The faster and more precise the system, the smaller the difference can be before problems happen. Some users are using differences as little as 0.005 and others are using much bigger numbers such as 0.1. In certain games, tighter differences (e.g. 0.001) may run perfect-smooth for several minutes, before having a long sustained surge of stutters. (Less frequent, but very severe, sustained stutter surges). Using “Fast Sync” instead of “VSYNC ON” may reduce this into a single micro stutter. In certain games, looser differences may run perfect-smooth for a shorter time period and then have one nearly-invisible micro stutter. (More frequent, but very tiny stutters). Most systems already have high precision clocks (HPET, TSC, etc). However, if you intentionally manually disabled this setting in your BIOS, turn it back on. High-precision clocks are needed for microsecond-accurate stutter-free frame rate capping. Experiments have been made with predictive frame rate capping, which is a feature of GeDoSaTo open-source software, to eliminate the need to follow these instructions for precision differences between fps and Hz. Predictive frame rate capping is not yet a feature of RTSS (though it should be!) as it is a worthwhile feature according to input lag tests. Some, not all, emulator software also have similar custom syncing options that reduce input lag. Experiment until you get acceptable low-lag VSYNC ON behaviour. A variable refresh rate (VRR) monitor is a much easier low-lag way to get perfect “VSYNC ON” motion. Software with internal frame-rate caps (e.g. emulators, video players, framerate-limited games) will run very smoothly and at very low latencies. Everything can be made to look stutter-free “VSYNC ON smooth” at all frame rates on a G-SYNC and FreeSync monitor — changes in frame rates can occur without stutter! See animation demo of stutter-free changes to frame rates. A frame rate of 47 fps automatically means the monitor is running at 47 Hertz, and without stuttering or tearing. Even VRR also helps with fixed-frame-rate games, console ports, emulators, by synchronizing frame rates with less lag than ordinary “VSYNC ON” — and adds the ability to reduce/erase the visibility of single-frame-drop stutters that can still happen with VSYNC ON. Make sure you’re running on a VRR monitor such as a G-SYNC monitor or FreeSync monitor. For games, many work fine in VRR mode by default. Certain games need you to turn on/off “VSYNC” in the game to trick G-SYNC or FreeSync to work. For emulators, configure it into Direct3D/OpenGL mode. For video players, use a Direct3D-capable video player such as SMPlayer. For specific software (e.g. emulators, video players), you will need to configure it to run in a Direct3D/OpenGL mode in order to take advantage of G-SYNC or FreeSync. We were the first site in the world to discover an input-lag-reducing trick for G-SYNC in year 2013-2014 via G-SYNC Preview #2. We did further extensive tests in 2017 on a 240Hz G-SYNC monitor as part of G-SYNC 101: Input Lag Tests. Use a framerate cap of a few frames per second below refresh rate. Example: 138 fps cap on 144 Hz monitors. Example: 235 fps cap on 240 Hz monitors. In-game frame rate capping has less lag than external frame rate cap software such as RTSS or NVInspector. VRR can successfully runs smooth with approximate/imprecise frame rate caps. If there is no in-game frame rate cap capability, use RTSS which was tested to be lower lag than NVInspector and other capping utilities. That way, frame rates can fall harmlessly without visible stutter. And when running flat-out at full frame rate, no unnecessary frame rate buffers pile up. This avoids creating unwanted “VSYNC ON” level of input lag whenever hitting maximum frame rates during uncapped VRR game play. Also, fixed frame rate operation has less lag at higher refresh rates (e.g. 60fps @ 240Hz) than lower (e.g. 60fps @ 144Hz or 60Hz). 60fps on high-Hz VRR looks visually stutterless & smooth as 60fps VSYNC ON, except with less input due to faster refresh cycle scan-out per frame. All VRR displays also supports VSYNC OFF too. This includes all G-SYNC monitors and FreeSync monitors. There are people who play CS:GO with VSYNC OFF, and switches to using G-SYNC or FreeSync for other games for better, smooth motion without stutters or tearing. 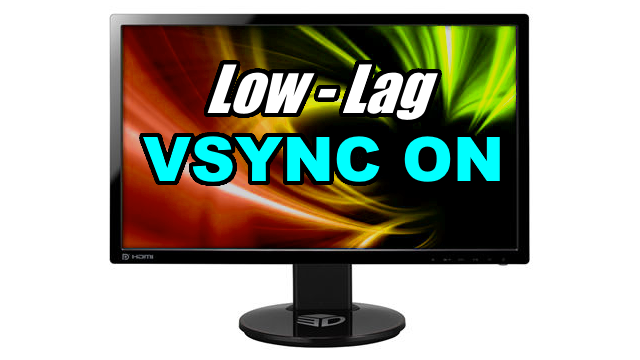 If you have a very high refresh rate (240Hz), the input lag of G-SYNC becomes similarly low as VSYNC OFF (unlike at 60Hz where the difference is much bigger). 240Hz VRR is capable of eSports-quality gaming. By adding sheer Hertz, VRR becomes suitable for professional gaming. When you say “VSYNC ON” in the tutorial, do you mean in the nVidia driver settings or in the game itself? Thanks! Regarding VSYNC + framerate limiting, in order to test whether you have chosen the correct framerate limit, you can do the following. Enable RTSS framerate limiter but don’t enable VSYNC just yet. Notice at which point of the screen you see the tearing. If it’s working correctly, the tearing should stay at the same vertical position and move downwards really slowly. If it stays in the same position for ever or moves upwards, then your framerate is higher that the screen’s refresh rate and when you enable VSYNC, 2 buffers will be queued. If it’s changing position rapidly, framerate limiting doesn’t work as expected. Umm I don’t get it, it seems very contradictory to say on top of the article that (Other frame rate limiter software “IN-GAME” were not as accurate) but then near the end of article it says (In-game frame rate capping has less lag than external frame rate cap software such as RTSS) so seriously wtf guys lol. Is it better to use RTSS with a non-G-Sync monitor but to only use an in-game limiter and avoid RTSS if you use G-Sync?! PS: You guys might want to say next time WHERE to reach that hidden config file which isn’t named config at all. It’s actually (Global) with no extention and is at the path below. Also right under (Framerate > Limit=119988) there was nothing else and no such (LimitDenominator=1000) so I guess I had to add it there but again I shouldn’t have to guess it after reading such a long guide. Ah and when saving the edited file, it created a file with a .txt extention so I guess I had to copy the file to replace the original and THEN unhide extentions to remove the .txt so it appears the same as the original file? I’m a tech support guy but it is way too savvy for the average joe. Why is the frame rate cap lower than the monitor refresh rate? Just curious. Wouldn’t this lead to “dropping” a frame periodically as you are creating less frames than are being displayed? It would, but that’s the trade-off with a fixed refresh display; you can achieve increased responsiveness with an FPS limit set below the refresh rate at the expense of recurring stutter. RealNC’s listed method is the most balanced approach, and the stutter due to repeated frames will occur far less with said method when compared to a straight -1 frame limit (e.g. 59 FPS at 60Hz), but the only way to avoid this completely is to use a variable refresh rate display.